Where can I do some coworking in Berlin? A question that people asked me quite a bit in the last few month. This is why I created a Top 5 coworking spaces in Berlin, partly for free and partly open during the weekend ;). 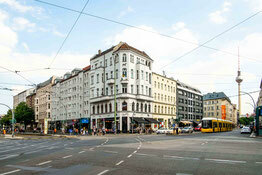 More than 1,000 people will soon be working not only on the seventh floor of the Sony Center. The WeWork Berlin at Potsdamer Platz is one of several spaces in Berlin. Here you can network until you drop and of course work – with a fantastic view. Regular events such as business lunches are organized to promote exchange among the members. From freelancers to start-ups you will find many different people here. But if you like it small(er), you are at the wrong address here. 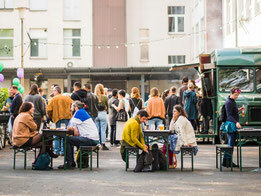 In a former film production site in the heart of Kreuzberg you will find coworking jobs as well as events and seminars around Social Innovation & Entrepreneurship. One focus of Social Impact's work is on supporting social startups. They receive scholarships and qualification programmes, which usually cover eight months of professional consulting, coaching, networking, workshops and coworking jobs. So just apply, if that's what you're looking for. 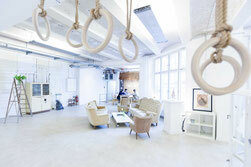 Betahaus is the place to meet start-up people and creative souls. 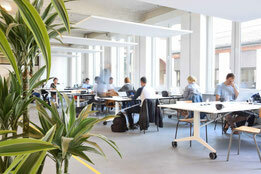 This coworking space offers free internet and plenty of food and coffee at the Betahaus cafes on the ground floor. If you want a more stable freelancer life, you can also rent a table here. Another advantage is that you can also be productive here as early as 9:00 am. Satellite Office has three locations in Berlin: Ku'damm, Französische Straße and Unter den Linden. So to speak the best addresses. It was founded 21 years ago by Anita Gödiker. At a time when the word coworking didn't even exist! The coworking at Satellite Office is different from the others. It stands for casual luxury workspaces. Therefore, there is quite a lot of space and quiet, there are individual offices, team offices, meeting rooms, fireplace lounges and an open bar ;). And, as of November, they will again be presenting the Female Founder Award! Besides a poster in Café Cuccuma in Zossener Straße this coworking space is hardly advertised and very hidden, namely in the backyard of Gneisenaustraße 27. Here you can also get filled bagels, tasty cakes, coffee and other drinks. This space is one of my favorites because it's not overcrowded yet and it's very stylish.